So how are you celebrating the start of the new year. I guess most of us have a party with good friends or family. But do you have other things you do? 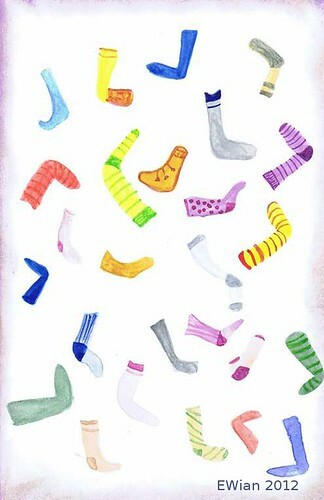 I throw all the old lonely socks. You know those socks that partners have disappear in the laundry. Last year we were not home at Christmas, so we forgot the lonely socks. So this time it was extra many are actually 60! The distribution was as follows: Mine 9, my dear husband 13, Zack 17 (he is 10 years), and last but not least, Tobias 21. I do not know how we do it. Happy New Year Ewian! I call that to be the sockeating animal. Yours must have been hungry this year. Many many thanks for the beautiful Christmas card. New year post will be sent to you. I know what you mean about the runaway socks! Many thanks for the lovely card you sent. I'm sending all good wishes for a beautiful 2012. May it bring you good health and happiness. Happy New Year Ewain! Thank you so much for my wonderful Christmas card! What a blessing..you made my day for sure! !